The world's first collection of one-of-a-kind, designer-made wedding couture fashioned in luxuriously soft sheets of Cashmere Bathroom Tissue (BT), floated down the aisle at the 12th Annual White Cashmere Collection™ fashion show, Tuesday, September 29, at The Carlu, in Toronto. Celebrating love and romance, 15 top Canadian bridal designers presented an exquisite show of Cashmere Bathroom Tissue Couture™ gowns, lingerie and accessories, all in support of the Canadian Breast Cancer Foundation (CBCF). 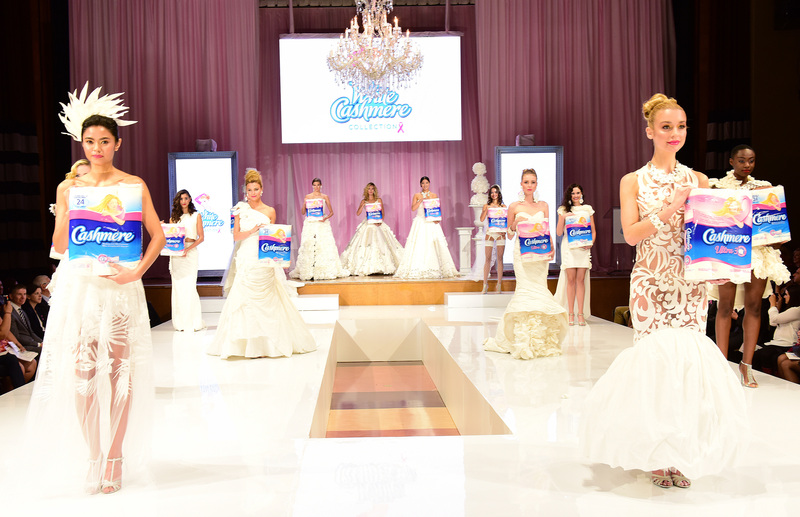 The spectacular bridal showcase was curated by Jessica Mulroney, Kleinfeld Hudson's Bay. "The White Cashmere Bridal Collection provides a unique and welcome spotlight for Canada's top bridal designers, and gives us a chance to support a life-saving cause that touches women and their families," says Curator, Jessica Mulroney. "The designers' hard-work, passion, creativity and diversity are gloriously displayed in their brilliant creations that feature everything from fabulous beading, braiding, and flowers to layers of ruffles, sheer and lace bodices, all meticulously crafted in Cashmere Bathroom Tissue." The 12th Annual White Cashmere Collection included a spectacular, invitation-only runway show, a portfolio of high-fashion Cashmere BT Couture photos by famed Canadian wedding photographer Babar Khan, and a Vote Couture for the Cure™ consumer promotion for CBCF. An annual fund- and awareness-raiser for the Canadian Breast Cancer Foundation, the White Cashmere Collection is produced by Kruger Products L.P., maker of Cashmere Bathroom Tissue and highlights the brand's ongoing commitment to help end breast cancer. It debuted in 2004 and has featured more than 135 top Canadian design talents to-date. The annual event kicks-off October Breast Cancer Awareness month and heralds the seasonal return of limited-edition Cashmere in support of the Canadian Breast Cancer Foundation. With twenty-five cents from the sale of every package going directly to CBCF, the limited-edition Cashmere provides Canadians with the opportunity to help make a difference in the lives of women and their families affected by breast cancer. "We take great pride in supporting Canada's fashion industry with a memorable Bathroom Tissue Couture show for Breast Cancer every year," says Nancy Marcus, Corporate Vice President, Consumer Marketing at Kruger Products L.P. "Our goal is to raise much-needed funds for CBCF, but it doesn't stop there. We provide year-round support for the cause with all our quality tissue products. The White Cashmere Collection is one of the world's longest running, most successful Corporate Social Responsibility programs, designed to help CBCF create a future without breast cancer." Canadians can view this stunning collection and support the cause by joining Cashmere's unique Vote Couture for the Cure™ Wedding Edition initiative at www.Facebook.com/Cashmere. Canadians are invited to vote for their favourite bridal couture and Cashmere will donate $1 for every vote, up to $10,000, to CBCF in the winning designer's name, from September 29 through November 3, 2015. Voters will be entered in a draw to win weekly prizes with the chance to WIN a Kleinfeld Hudson's Bay Wedding Dress valued at $5,000. More than 250 invited guests including Canada's top fashion industry influencers, leaders, designers, and the media, not to mention Toronto Mayor John Tory and his wife, Barbara Hackett, attended the exclusive event. #Cashmere15 was photographed by bridal photographer, Babar Khan, at Malaparte, at the TIFF Bell Lightbox, Toronto. Please check out Babar's brilliant portfolio at Cashmere.ca and Facebook.com/cashmere. Long time collection supporters, Marc Anthony Salon and MAC Cosmetics, produced gorgeous hair and make-up for both the photo shoot and runway show, with shoes generously supplied by Town Shoes, and fresh floral bouquets and centerpieces by San Remo Floral Design Studio. "The Canadian Breast Cancer Foundation is grateful for the incredible commitment and support of Kruger Products L.P. A long-standing partner of CBCF, Kruger Products has made a significant contribution to the breast cancer cause by enabling research, education and advocacy initiatives that are making a difference in the lives of women and their families experiencing a breast cancer diagnosis," said Lynne Hudson, CEO, Canadian Breast Cancer Foundation. "Through the White Cashmere Collection, Kruger Products continues to demonstrate their commitment to CBCF's vision of creating a future without breast cancer." A celebration of Canadian fashion that unites Cashmere Bathroom Tissue, designers and the Canadian Breast Cancer Foundation, the White Cashmere Collection™ is a stunning showcase for Canada's established and emerging design talent and has brought more than 135 top Canadian fashion designers together since 2004. An annual fund- and awareness-raiser for the Canadian Breast Cancer Foundation, the White Cashmere Collection is the first-of-its-kind in the world, and is entirely crafted in 100 per cent pure, luxuriously soft sheets of Cashmere Bathroom Tissue. Kruger Products L.P., maker of Cashmere, is one of CBCF's top five national brand partners and a proud supporter of the Canadian Breast Cancer Foundation since 2005. The White Cashmere Collection heralds the annual return of limited-edition Cashmere in support of the Canadian Breast Cancer Foundation, a corporate social responsibility initiative, with twenty-five cents from the sale of every package going directly to CBCF, throughout October Breast Cancer Awareness Month. Cashmere, Canada's best-selling bathroom tissue, reflects Kruger Products' commitment to providing the finest quality tissue products to Canadian consumers. Kruger Products is Canada's leading tissue manufacturer and serves the Canadian consumer market with such well-known brands as Cashmere, Cashmere UltraLuxe, Purex, SpongeTowels and Scotties, as well as away-from-home products for industrial and commercial use across Canada and the U.S.
Nancy Marcus, Corporate Vice President, Consumer Marketing at Kruger Products; Jessica Mulroney, Curator; and Farley Chatto, Artistic Director of the White Cashmere Collection 2015 are available for interviews. Tweet the White Cashmere Collection at #Cashmere15. To view the photo with this press release, please visit the following link: http://media3.marketwire.com/docs/White_Cashmere_Collection_2015_-_Photographer_Greig_Reekie.jpg. A celebration of love and romance took to the runway, on September 29, as 15 top Canadian bridal designers presented a breathtaking vision of a future without breast cancer with wedding couture fashioned in luxuriously soft sheets of Cashmere Bathroom Tissue.